Isaac Lowe hopes to establish himself as No.1 in the British featherweight division before the year is out. Morecambe’s unbeaten former English and Commonwealth champion returns to the ring at Windsor Park in Belfast on August 18. The Westgate Warrior’s first fight under new trainer Ben Davison will see him keep busy ahead of a rematch with British champion Ryan Walsh. That is expected to take place in October, the pair having shared a thrilling 12-round draw at the Manchester Arena in February. 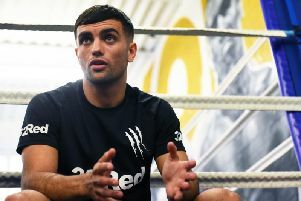 Walsh and Lowe’s second dust up is set to share the bill with Ryan Doyle and Jordan Gill’s clash for the Commonwealth title with Matchroom promoter Eddie Hearn then planning to match the winners of those two contests. “I’m not sure exactly how it’s going to work but I’ve been told that the winner faces the winner,” said Lowe, 14-0-3 as a professional. “If that’s what it is then I’m happy to do that. “I’ll fight whoever is put in front of me. “But if I win the British title and other things come in my direction then we’d have to consider it. “It’s one step at a time. I’ve got this fight in Belfast and then Walsh. “Hopefully I’ll deal with him this time and then if it means a rematch with Ryan Doyle or facing Jordan Gill then I’ll take whatever comes. “I want a busy back end of the year and hopefully I can have the British and Commonwealth titles by then. New cornerman Davison has risen to prominence in recent months as the trainer of Lowe’s good friend Tyson Fury. On leaving long-time trainer Jimmy Harrington in Doncaster Lowe quickly linked up with the former world heavyweight champion and now spends the week at his base at Ricky Hatton’s gym in Hyde, Greater Manchester. “It’s going really well,” said the 24-year-old, who has also challenged for the European title. “It’s a different environment and a different way of doing things. Lowe’s opponent for Windsor Park is yet to be confirmed with Fury taking on Italian Francesco Pianeta on the same bill in the second fight of his comeback after more than two-and-a-half years out. Home favourite Carl Frampton’s clash with Australian Luke Jackson tops the bill. “I haven’t boxed since February so it will be good to get back in there,” said Lowe.